Asan (아산) is a city in South Chungcheong Province in South Korea.It borders the Seoul Metropolitan Area to the north. Asan has a population of approximately 250,000. To get into Asan you can get a train (via Line 1 from Seoul) to Onyangoncheon station. This will land you in the middle of the city centre. If you're looking for hot springs then there is a very large hotel spa within a 5 minute walk from the station. You can take the bus to the city too. Regular buses run from neighboring city, Cheonan and also from Seoul. The bus terminal is slightly out of the city centre. A taxi downtown (Shi-nae) will cost you 2000won. You could also get a city bus (420, 410) which will take you to the train station. Asan (also known as Onyang) can be easily reached from Cheonan (30minutes by bus or 15 minutes by train) and Seoul (two hour and a half hours by slow train or two hours by bus). There is an convenient express train bound for Cheonan and starting from Cheongnyangri at the end of Line 1, almost as fast as the Nuriro. The closest KTX (bullet train) station is Cheonan-Asan. This station is about a 20 minute drive from the city centre. Regular trains connect the station to Onyangoncheon throughout the day. Alternatively, a taxi will cost you about 7000won to get you into the city centre. 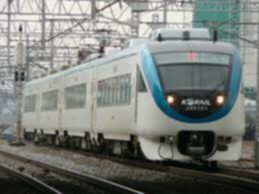 The KTX from Cheonan-Asan is the fastest option to/from Seoul, it takes about 30 minutes for about 15,000won and comes very often. There is also a KTX train to/from Incheon International Airport and it takes about two hours. Sinchang Station is the last stop on Line 1, if you're heading to Soonchunhyang University, it is also connected directly and efficiently to/from Seoul by the express train- Nuriro (a few times a day) and costing about 8,000won for an hour and a half journey. It has certain stops to Onyangoncheon, Asan, Cheonan, Suwon, Anyang, Yongsan, etc. To/from Onyang Folk Museum- Onyangoncheon Station (is a 10 minute taxi ride). There is also a harder-to-navigate local bus station in contrast to Seoul with signs being available in both English and Korean, the bus system in the countryside is quite difficult and does not cater to the rare foreign tourist. You'll need a good grasp of Korean and an ability to read Hangul, bus stops are quick to arrive and leave at a destination. Blue (sometimes Green buses) with a four-digit number travel on main roads for long distances and cost about 1,050won. Green Village buses with a two-digit number travel for shorter distances and carry travelers to transfer points (such as subway stations and longer bus routes) and cost about 750won. Yellow buses operate on a closed circuit within a city district and cost about 850won. Red buses are express buses that travel from a city to far-flung suburban areas and cost about 1,850won. Daum and Naver Maps have the schedule, routes of buses in the area, but the interface is all in Korean. Some buses in the Chuncheongnam-do province may or may not have a T-Money card scanner on board, be prepared to carry small change for traveling by bus. Most towns/cities in the Chuncheongnam-do province is very small by western standards and quite walkable, no more than half an hour to most places in contrast to Seoul. Shinjeong Lake (신정호) is located roughly twenty minutes away between the town of Onyangoncheon and Sinchang. 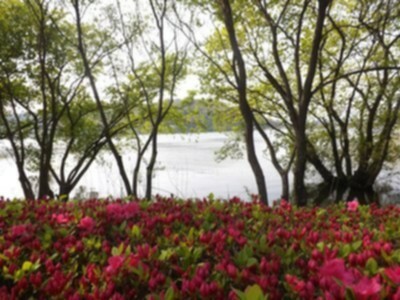 Shinjeong Lake is quite the romantic countryside setting in any season especially the spring. You can enjoy boat rides or bicycling around the area, or just take a stroll around the lake's pristine rose and tulip gardens. Take a taxi from either Onyangoncheon Station or Sinchang Station to reach Shinjeong Lake (20 minutes ride) ₩4500. Onyangoncheon Traditional Market (온양전통시장) The constant stream of both locals and travelers visiting the hot springs gave birth to Onyangoncheon Market. There are about 500 stores and 300 stalls selling local produce, fish, livestock products, clothes, and various household items. From Onyangoncheon Station, walk out onto the main street, and wander eastward for a couple of blocks. After this, cross the street and head south until you run into throngs of people. 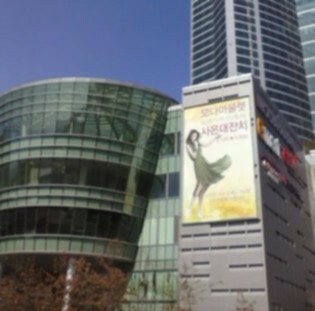 Cheonan-Asan CGV Pentaport (천안-아산 CGV 펜타포트) is the to-go place for shopping in Asan, after Cheonan and its Shinsegae Fashion Street. You will find the atypical mall environment, filled with Western brands and food chains, as well as a CGV Movie Theater on the top floor, a food court and E-Mart in the basement levels, and all in close walking proximity to the Asan and Cheonan-Asan (KTX Station). Walk ten minutes straight from Asan Station towards the twin skyscrapers and under the biaduct, you will see a large building with the iconic red CGV sign in front, and you've arrived at the Cheonan-Asan CGV Pentaport. Asan Kim Chi Making and Sharing Festival (아산 김장문화제) Yi Sun Shin Stadium, Asan-si (이순신종합운동장-아산시): Once a year during Chuseok (the Harvest Festival) sometime in the fall, university students in the Asan area get to experience first-hand how to make and prepare Kim Chi using fresh ingredients donated from nearby farms. As volunteer workers, the Kim Chi they manage to make and package will all go to the poor and needy throughout Korea. The Hot Springs (온천): The area is known for the oldest and most famous hot springs in all of Korea- especially the three major ones: Onyang, Asan, and Dogo. Definitely take a dip and enjoy the therapeutic and medicinal warmth of a traditional hot spring experience during the winter. Asan Spavis comes highly recommended and a day in the hot spring fetches at around 9,000won per person. SCH Phoenixia Festival (SCH 피닉스축제): A time for students to unwind before their finals and locals to come and enjoy the performances of famous Kpop artists (like Dynamic Duo, Orange Caramel, 2NE1, PSY, and EXO in the past) at Soonchunhyang University. Excessive drinking, partying, and group camaraderie is expected; so grab a mat, sit on the lawn, and join the crowd. Hike in Asan (하이킹을 가다): Go and take a hike! Seriously. Asan is just covered in mountains, mountains are everywhere and so are hiking trails. Some of the most notable ones are in Sinchang-myeon behind Soonchunhyang University is Maebong-san (매봉산); south of Onyangoncheon Station in Magok-ri is Gwangdeok-san (광덕산); and north of Sinchang and Onyangoncheon in Yeongin-myeon is Yeongin-san National Forest Reserve (영인산자연휴양림) where you could also camp and sled during the wintertime. Sinchang Bowling Alley (신창 볼링장): Apart from the now-closed fishing grounds in the murky pond next to Soonchunhyang University, students can walk into town, fifteen minutes from campus and play a few rounds of bowling with a few friends to relieve some stress, order some fried chicken delivery, or play 50won old-school arcade games like Mortal Kombat. For a good 5-6,000won, don't forget to mention student discount with your School ID. Lake-side Activities: At both tourist parks, Shinjeong-ho Lake (신정호관광지) and Sapgyo-ho Lake (삽교호 관광지), take a relaxing boat ride around the lake for pleasure with a loved one or with a motor in flaunting style from 5,000won and upwards. If boats aren't your style, there's also water-skiing for the more extreme adventurers- 10,000won and upwards. Both locations have lovely gardens and make for some great photographic scenery, take a laid back approach and for cheap by renting out a bicycle and bike along the shoreline for 2-5,000won. But of course, there's always fishing! Traditional Activities: At Oeam Folk Village, there's a bunch of things to do, from making tteok (rice cakes) to tofu. Or try your hand at gukgung (archery). Feeling more arts and crafts- they have demonstrations daily in paper lanterns, fans, and masks as well. At Onyang Folk Museum, you can experience a traditional marriage in the Joseon Dynasty or learn how to play some ancient instruments like a janggu (double-headed hourglass-shaped drum) or a buk (double-headed shallow barrel drum). An Afternoon of Screen Golf: In Daebang, Onyangoncheon, and Asan as well as most places in Korea, golfing is a popular sport except the greens you'll normally see in America and Europe are not to be found in the city. Instead, you'll find large, iconic green screen enclosures towering overhead to catch any flying balls from hitting the neighborhood. These driving ranges, famous with the older folks, costs around 15,000won for a set menu, a beverage, and a 6-hole round. Billiards: In Korea, four-ball billiards (known as sagu (사구)) is a popular sport for college students brought over from the west, just as golf. Roughly 2-4,000won a round. In Sinchang, there are two billiard halls in front of the back gate and one for student's in the basement level of Haeoreum. There are a few billiard halls near the Onyangoncheon Station and in Cheonan as well. Noraebang(노래방): Korean for "singing room" and similar to Karaoke. They are found throughout every city in Korea. In Sinchang, there are a few, and a main one in front of the back gate, next to Paris Baguette and Taehak Mart. Go with a group of friends, rent out a private room with a karaoke machine and order in beer (and sneak in some soju), its going to be a long, fun-filled, but embarrassing night. For most noraebangs, expect to pay 15,000won per hour. Asan is not the usual place to buy specialty items other than hygiene and health products from the various hot springs and spas (in Dogo, Asan, and Onyang). 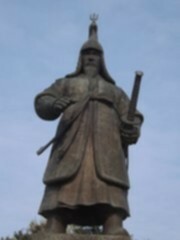 Since Asan is also well-known as the home of legendary Admiral Yi Sun-Sin, you can probably find memorabilia relating to him (such as turtle ship (geobukseon) figures, books on his exploits, and other Joseon-era related goodies). Most of which can be found at Hyeonchungsa Shrine, Onyang Folk Museum, and Oeam Village. The most well-worth buys would be from the Onyangoncheon Market. You can buy cheap Chungcheong street food and traditional medicines from the vendors. Yeonyeopju (연엽주) is a folk wine and Intangible Cultural Asset to the Oeam Village in Asan. It was a wine offered to the King made of Nuruk (glutinous rice) and Yeongeun, mixed with fermented evergreen or lotus leaves. A smooth beverage with alcohol levels at 8-15%. It has an interesting balance of sweetness, acidity, and a yeasty aroma. Myeoncheon Dugyeonju (면천 두견주) is a medicinal liquor and Intangible Cultural Asset from the nearby town of Myeoncheon. Brewed with Azalea flower petals, water drawn from the Ansaem Spring, and Nuruk (glutinous rice). Its origins were traced back as far as 1,200 years ago (Goryeo Dynasty) by the town's families. It has a deep, profound fragrance, a high alcohol content of 18%; and a subtle tasty flavor, starchy texture to it. There are a variety of restaurants spread throughout the Asan area. Depending on what you're craving for, you have a wide selection of traditional Korean restaurants alongside many fast-food chains that you could go to. On average, the price for one meal per person can range between 4,000 won to 8,000 won. In Asan: There are two main areas for food- the Pentaport and Lotte Mart on the other side of the station. Du Maris Buffet (드마리스뷔페)- 210 Gwangjang-ro, Baebang-eup, Asan-si, Chungcheongnam-do. Du Maris is a premium buffet Korean-western fusion restaurant. (Monday-Friday Lunch: 24,000won/ Dinner: 31,000won and Saturday- Sunday Lunch: 33,000won/ Dinner: 33,000 won). Hwangsogopchang (황소곱창)- 228-1 Jangjae-ri, Baebang-eup, Asan-si, Chungcheongnam-do; it's five minutes from Asan Station, Exit 2 and it specializes in "Gopchang" or grilled pork intestines. Pungkyeongmaru (풍경마루)- 1767 Jangjae-ri, Baebang-eup, Asan-si, Chungcheongnam-do; is a Japanese-styled Shabu Shabu restaurant at Y-Mall across the street from Cheonan-Asan KTX Station. Food Empire (푸드엠파이어) is known for its tea, latte, coffee, pork cutlet bujabap, grilled bulgogi noodle, jjambong, and jajangmyeon gimbap. Menmusya (멘무샤) is a fusion Japanese-Korean restaurant specializing in katsu, ramen, and tantan-men. Abikko (아비꼬) is a Japanese-styled restaurant with variations of curry rice. Nolbubossam and Budaejjigae (놀부보쌈 & 부대찌개) is a Korean restaurant perfect for large groups, focusing on budaejjigae,nakji dalkgalbi, jjukkumi samgyeopsal. In Daebang: The main boardwalk from the station to the apartments, a mile away is where most of the restaurants are. Anteoteok (안터덕)- 14 Galsankyo-ro, Baebang-eup, Asan-si, Chuncheongnam-do; a Korean traditional style restaurant that features duck meat, perfect for large groups. It is about a 10-20 minute walk from Daebang Station. Inaeshiktang (이내식당)- 601-2 Buksu-ri, Baebang-eup, Asan-si, Chuncheongnam-do; a premium grilled beef samgyeopsal restaurant, only ten minutes from Daebang Station. Jasaneobo (자산어보)- 31 Buksuseo-ro, Baebang-eup, Asan-si, Chuncheongnam-do; a Korean seafood restaurant that specializes in bibimbap, haemuljjim, and Daegu maeuntang, only ten minutes from Daebang Station. 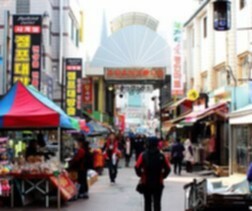 In Onyangoncheon: The marketplace and adjacent buildings is the main area for restaurants in the city. In Sinchang (Soonchunhyang): The town is mainly restaurants. There are also five cafeterias in SCH- Hanoori, Haemaji, Haeoreum, College of Humanities, and near the Graduate School. There are also convenience stores throughout as well as a bakery in the Dance Building and Student Union. The new building near Haemaji will also have a food court by 2015. 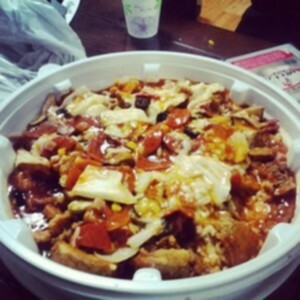 Mr. Pizza- (미스터피자) Korean-style pizza for delivery or eat-in. Lotteria (롯데리아)- a Korean burger joint, similar to McDonalds. The patbingsoo, bulgogi burger, and ice cream are the most popular items. Waffle Lui (와플루이)- known for its pizza and pasta. Family Takeout is at the very front of the back gate area, you can order cheap toast sandwiches for 1,500won or fruit smoothie/juices for 2,000won. The on-the-go trip food or budget meal. Ministop (미니스톱) is the most common place to drink in all of Korea for foreigners along with just about any convenience stores (7-11, Buy the Way, GS25, Storyway, and CU). As long as there's a bench outside, its open for anyone to drink their heart away and buy even more alcohol (or the occasional drunk craving for various shrimp, potato, and octopus chips, possibly soft-serve ice cream too). Clever marketing scheme! You'll find Ministop anywhere throughout Asan. In Sinchang, its on the main boardwalk (past the Paris Baguette and Noraebang) nearest the back gate. Black Box (블랙박스)- T: 041-542-4626- Black Box is another popular bar for group parties (~15) in Sinchang, small in terms of the other drinking places but relatively less crowded. It is located to the left of the back gate as you walk out of Soonchunhyang. On the second floor of the GS25, Tour Les Jours, and Alpha's. You will see a large, black background sign with white text for "Black Box". The closest drinking hole from the university. EZ’s (이지스)- T: 041-542-8551- EZ's is the most popular and biggest bar for group parties, catering to ~5 people in the drinking boxes and with a few main feasting tables at the center that can cater to as much as ~30. The owner is very friendly and the service at EZ's is great. The men's bathroom is quite a mess, unfortunately, if you were to use it. The large pitchers of beer and flavored soju from lemon to cherry is the best. EZ's is on the third floor of the building with a Noraebang sign at the front, next to Ministop, right above Lemontree. RnB (알엔비)- T: 041-541-0334- is the second most popular and biggest bar in Sinchang for group parties, with almost the same capacity as EZ's- a large feasting table at the center that can cater to as much as ~30. The service is great and the bathroom is shared between sexes, though much cleaner in comparison. Just as EZ's there are large pitchers of beer and flavored soju, as well as party-friendly menu of food like fried chicken and kimchi-jjigae, but altogether a little more pricier. RnB is in the building between EZ's and the Paris Baguette, above the Ministop on the second floor. Mom’s Touch (맘스터치)- T: 041-533-4666- is another group-friendly party, quite busy throughout the year and used moreso by the Korean students. Not only a burger joint, it has many private group party rooms that can fit 10-15 people in them and a spacious annex in the back for parties with 20+ people as well as the area outside nearest to the ordering counter. Mom's Touch is very much the usual place for bbantings (suite meet parties) at the beginning of the year, when a girl's dorm suite and a guy's dorm suite have like a suite date of sorts with lots of drinking games and just casual talking. Cafe Downtown (Hof)- a less-frequented beer joint by the international students in Sinchang, Cafe Downtown is mainly a bar for the expat teachers from the university and Korean students. It's further down the road from EZ's and RnB before Donday and the samgyeopsal restaurants with the Sinchang Taxi headquarters behind Cafe Downtown. Dalbong Kamja- T: 041-544-2024- Not only a place for french fries, but also flavored beer. Dalbong Kamja is a beer bar located on the second floor of the cafe in front of the back gate and across from Family Takeout. Pomme Frites (폼프리츠)- Not only a place for french fries, but also flavored beer. Pomme Frites is a beer bar located at the very end of the main boardwalk, way past EZ's and RnB and the samgyeopsal restaurants, on the way to the Sinchang Bowling Alley. In the Asan area, there are no real cheap housing options to the eyes of a tourist. You will not find any tourist-friendly guesthouses, hostels, love hotels, motels, or the usual options you might find in Seoul and Busan. 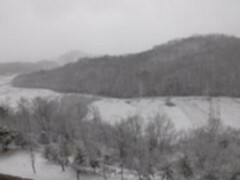 Asan and nearby Onyang is known for the best hot springs in all of Korea, thus you'll find more and more hotels rather than the small chains. Your best bet for cheap housing for a night is to find a jjimjilbang (sauna), which is characterized with the iconic red crescent and three steam symbol. Jjimjilbangs' require a proficient ability in Korean especially in the countryside. You will spend an average of 8,000won or more a night at the Jjimjilbang, be prepared and comfortable to get naked with other people to use the communal baths and sleep on the matted floors. The following listing of hotels are within the Onyangoncheon area of Asan city, nearest the hot spring/resort area. Price range for the following hotels are 40,000won at the most cheapest rates to 140,000won for the most expensive per night. In perspective, Seoul and Busan have very comfortable guesthouses at around 14,000-20,000won a night and jjimjilbangs are around 8,000won a night. ING Motel- Goodstay, 17 Chungmu-ro 8beon-gil, Asan-si, Chungcheongnam-do, Korea (충청남도 아산시 충무로8번길 17 (온천동,유성장모텔)), [email protected], , +82-041-542-3313, From the Asan Express Bus Terminal, take express bus no. 512, and get off at Asan Hot Springs. Located in a tourist spot famous for hot spring, ING Motel is a good place to enjoy spa as it is 5 minutes distance away from Onyangoncheon Station. At 58 degree high temperature, Onyang Spa was favorite place of kings of many generations and has good alkaline water quality. 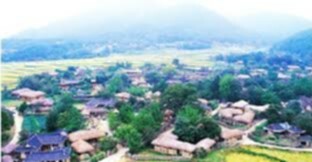 As for nearby tourist attractions, there is Hyeonchungsa where the incense is always burning to cherish the virtue of Chungmugong Yi Sun-sin, and Onyang Folk Museum full of ancestors’ legacy and folk data. It has 27 standard rooms. Room amenities include a TV, fridge, AC, laundry service, dryer, and internet. Onyang Cheil Hotel, 1462 Oncheon-daero, Asan-si, Chuncheongnam-do, +82-041-547-2500, , Located within a 10-minute stroll from Onyangoncheon Station, The Cheil Hotel Onyang provides guests with an ideal base when in Asan. There are a range of amenities at Palace Hotel Asan that travellers have access to, including a coffee bar and an outdoor pool. The hotel provides rooms equipped with a TV and a hair dryer. A satisfying breakfast is prepared each morning at The Cheil Hotel Onyang, and there are numerous cafés and eateries close by that travelers can try for lunch or dinner. Palace Hotel Asan provides an ideal place to explore Spavis, as well as everything the local area has to offer. ￦69,000~ (Standard- Double, Twin, or Ondol), ￦71,000~ (One Person Standard- Double, Twin, or Ondol), ￦117,000~ (Junior or Ondol Suite), and ￦121,000~ (One Person Junior or Ondol Suite). Onyang Grand Hotel, 7 Chungmu-ro 20beon-gil, Asan-si, Chungcheongnam-do, +82-041-543-9711, , Grand Hotel Onyang provides modern accommodation in Asan and is a short stroll from Onyangoncheon Station. It has a golf course, an indoor pool, a mineral bath and a sauna. All rooms at Onyang Grand Hotel Asan have air conditioning and offer a mini bar, a refrigerator and a flat-screen TV with room service available. A seating area, a telephone and bottled water can be found in each. The bathrooms have a bathtub and provide a hair dryer. A buffet breakfast is served every morning at Grand Hotel Onyang, and there are numerous cafés and eateries nearby that travelers can try for lunch or dinner. ￦96,000~ (Standard Double or Single Room). Asan W Tourist Hotel, 14 Chungmu-ro 20beon-gil, Asan-si, Chungcheongnam-do 336-010 (아산 W 관광호텔,336-010충무로 20번길 14), Offering a restaurant, Asan W Tourist Hotel is located in Asan. WiFi and on-site parking are available free of charge. Each room here will provide you with a TV, air conditioning and a computer. Complete with a refrigerator, the dining area also has an electric kettle. Private bathroom also comes with a bath and a shower. You can enjoy city view from the room. At Asan W Tourist Hotel you will find a communal sauna, free shuttle service and a 24-hour front desk. Other facilities offered at the property include meeting facilities, a shared lounge and dry cleaning. The hotel serves continental breakfast at a fee at the restaurant on the 3rd floor. Breakfast is available from 07:00 until 09:00 from Tuesday until Saturday and from 08:00 until 10:00 on Sundays and bank holidays. There is a buffet-style restaurant in the facility. ￦80,000~ (Standard Double Room). Seoul is the capital of South Korea. It is connected to Cheonan-Asan by KTX (40 minutes away, 15,000won), Sinchang by Nuriro (1 hour, 30 minutes away, 6,000won), and Sinchang by Line 1 (2 hours, 30 minutes away, 4,000won). A fascinating blend of ancient traditions and cutting-edge digital technology, home to endless street food vendors and vast nightlife districts, an extraordinarily high-pressure educational system and serene Buddhist temples, a trend-setting youth culture and often crushing conformism, extraordinary architecture and endless monotonous rows of grey apartment buildings, Seoul is a city filled with stark contrasts. Incheon is the destination of your arrival and departure to and from South Korea, Incheon Airport is connected to Cheonan-Asan by a special Airport train (2 hours away, 25,000won) as well as airport buses to/from Asan (Onyang) and Cheonan Intercity Bus Terminals (2 hours, 25 minutes away at around 20,000won, reservations required).